Before you start to cut a new skirt or to alter old, you need to consider how you will be treated the hem. Because of the neatness of the finishing depends on the entire appearance of the finished product. Treat the bottom of the skirt and a hidden seam. To do this, bend at the level where you need it, Tutuila fabric. If necessary, lay a line of basting stitch on the fold line. Choose a thread as close as possible in color to the fabric skirt. Sew the thread in one addition on the reverse side. Fold 0.5 cm of the edge of the hem inside, so the cut was in between the front of the skirt and hemming. Enter the thread in the fabric will catch 1-2 threads of the material of the front skirt, not pulling out a needle, grab a few strings of fabric, which is sutured. Gently pull the thread and the needle, tighten. Again grab a thread or two the front of the skirt, a few strands of ACC. So repeat in a circle. Do not overtighten the thread to the hem of the skirt is not "going". Upon completion Tutuila hem. Use the lace, if the cut of the skirt allows. Handle on the sewing machine the contour of the hem stitching-zigzag, delete unnecessary threads. Fold the 1-1. 5 cm hem on the inside, Tutuila. Put lace from the wrong side to see it "peeking" out of the fold, sew a basting seam. Try to keep around the hem lace width were the same. Make on the sewing machine line, stepping back 1-2 mm from the edge of the bend of the main matter of the skirt. Remove the basting stitch. Sew the hem the bias tape, you can buy in the store. This option is especially good if you need to handle the edge of the circle skirt. The bias tape you must first pristroit from the wrong side of the skirt, then carefully tack the facing side, lay the line on the sewing machine. For children's skirts, you can choose bake, contrasting colour to the main fabric of the skirt. The bottom of such skirt can be treated a small line of zigzag on the machine, made a small hem on the wrong side. If you have a wardrobe appeared skirt original style, cut which flatters the figure, wonderful color and good fabric pleasing to you, but the length of the skirt too big, this disadvantage can be eliminated by exerting effort and spending a little time. Wear shoes and try on a skirt in the mirror. Ask to look at ourselves and find the best option length. Make a small mark or stick pin. Remove the skirt, put it on the table and unfold. Measure the distance from the edge of the product to the mark you made when fitting. With a ruler and flat chalk mark this distance 5-7 cm across the width of the hem. Smoothly connect the dashes - this is the new bottom line. From the chalk line down, put 2-3 cm around the hem and do another line. It cut the fabric and treat the line of cut. 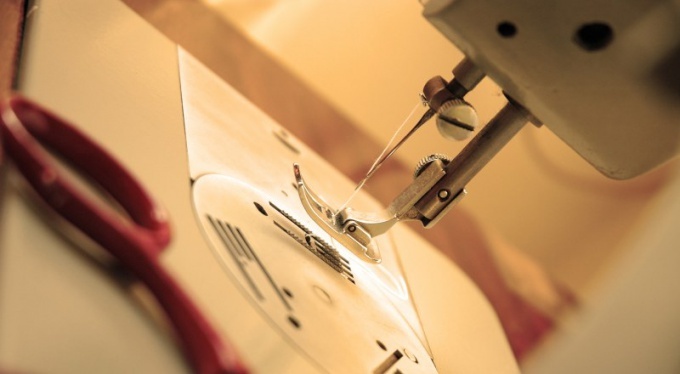 To do this, use special serger or overlock stitch on your sewing machine. Lightly iron the serged edge of an iron through a damp cloth. If you slightly shorten the product, the chalk mark can be matched with decorative stitching at the hem of the skirt. In this case, the first strut position, amperite it, and then measure the desired inches. If you shorten a skirt with a slit, the first strut amperite stitching and iron the hem. Cleave the pin or staple the two parts, and then with a ruler and tailor's chalk the planned line. the adhesive cobweb. Put it in so that its edge coincides with the edge of the ACC. Iron the bottom of the skirt using a damp cloth with a hot iron. For warm products thick fabric is better to sew by hand, using strong thin thread. The final touch in the design of the skirt will be executing decorative stitching at the distance of 0.3-0.5 cm from the bottom. The edges of the skirts from fine fabrics quickly crumble, so they should be treated quickly. If the hem is uneven, it must first align, and then charting a new hem line.